Furniture transport to Spain should not be left until the last minute, otherwise you may discover that the firm you want to use to carry out your removals from the UK is fully booked. Your options if that happens are to use a different firm, or you hire a van and self-drive. The problem with hiring a vehicle for moving furniture to Spain is that the ones you are legally allowed to drive are usually going to be smaller than you need, for the most part. Unless the move is only a small one, and you don�t need to take all of your furniture and belongings with you, then a 7.5 tonne lorry is likely to be what suits your needs best. This is classed as a C1 vehicle. However, unless you have category C1 on your driving licence then you are not legally allowed to drive a C1 vehicle. Anyone who passed their driving test before 1997 is automatically entitled to drive a C1 vehicle; but licence holders who passed after that date are not allowed to, and you would be breaking the law if you tried. In practical terms, this means that, if you choose to hire a van and drive yourself and your furniture to Spain, you would, through necessity, have to choose a smaller van. A smaller van taking furniture to Spain � and staying within weight restrictions � would mean you had to make more than one journey, assuming you are taking a house full of furniture and possessions. 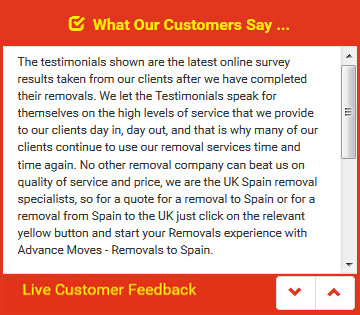 To make it easier on everyone, plan and book your furniture removals to Spain well ahead of time. Advance Moves has been specialising in furniture transport to Spain for almost two decades, and can offer you an excellent service. Our website shows our dedication, with countless testimonials from previous customers. There�s also the facility to find a quick quote for your own move. For more information, please don�t hesitate to get in touch on 0871 218 0612 or email info@advancemoves.com.